Helicopters and divers combed the Bamboo Ridge area, a popular but dangerous fishing spot near Sandy Beach where a fisherman was last seen yesterday morning. Rescuers searched through the night and are expected to continue today to look for the missing fisherman, whom co-workers identified as Stanley Chen, a 60-year-old Waikiki man. A 47-square-mile search by boat and helicopter in daylight was continued into the night by the U.S. Coast Guard Cutter Galveston Island, said Coast Guard Petty Officer Michael De Nyse. "We're doing all we can to reunite the fisherman with his loved ones," De Nyse said. Honolulu police have opened a missing-person investigation. Chen's car, a tan Nissan Sentra, was still parked on the side of Kalanianaole Highway. Chen's cooler and fishing poles were left set up at the tip of Bamboo Ridge. A memorial sits at the top of the area for all the fishermen who have died in the waters below. "You can't really do anything but hope for the best," said a former employee of Chen's store, Peony Arts, a Hawaiian quilts and gifts shop at the Marriott Hotel. At 7 a.m. yesterday a fisherman was looking for a good spot to fish. 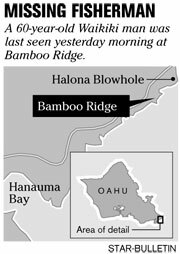 From a distance, past Lanai Lookout, he saw there was one person on Bamboo Ridge, said fire Capt. Terry Seelig. "He saw the silhouette of a fisherman," Seelig said. "Thinking there were less people there, he went to Bamboo Ridge to fish. But when he got there and set up, he noticed that the fisherman wasn't there. After a while he knew that wasn't a good sign." With Chen's supplies still there, the man called 911 at about 8:20 a.m. and reported a missing fisherman. 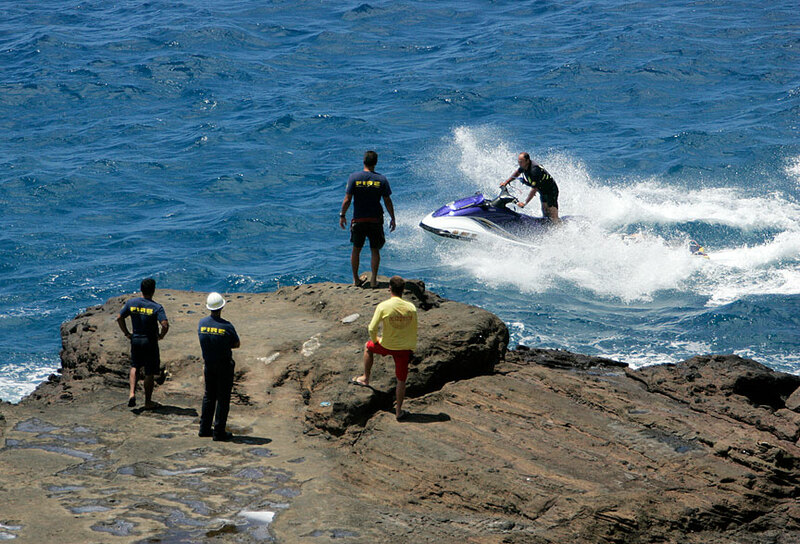 After confirming that he was missing, police officers called the Honolulu Fire Department for help at 9:09 a.m.
More than a dozen rescue personnel from the Coast Guard, Fire Department and Ocean Safety Division searched from Makapuu Point to Diamond Head. Two helicopters from the Fire Department and Coast Guard aided in the search until sunset and are expected to resume this morning. The waters and wind were calm yesterday, Seelig said, but the spot can still be hazardous for inexperienced fishermen. "An inexperienced person that does not know the conditions doesn't know how dangerous this place can be," he said. Chen's co-workers said they never heard him mention fishing as a hobby. They talked about his business and little else, they said. Chen's brother showed up at Bamboo Ridge in the afternoon. He went down to the spot where his brother was last seen and then up to the Blowhole parking lot. Declining to talk, he quietly watched rescuers for a long time as tourists nearby spoke of how beautiful the water was.